We look forward to seeing you there Friday October 10! Better than seeing a therapist, and cheaper too! The writing on the wall is telling us that the future of education is online. But one professor refuses to accept it! 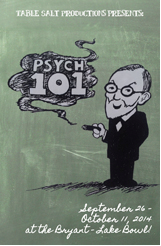 Come join Jim Robinson as he makes one last-ditch attempt to stem the rising tide - in Psych 101! You, the audience, are also the students, along with perennial Table Salt favorites Joshua Will, Michelle Cassioppi, Rachael Flanery and Dennis Curley. Sing along with the songs, laugh along with the sketches, and take an entire semester of Psych 101 in just 90 minutes (complete with midterm and final)! LGBT Therapists hopes to see you there October 10 (look for our flag), but if you can't make it, we hope you'll see the show another night. Be on the lookout for a survey soliciting your input for this likely return event. Oct 20 for four weeks - 6-8pm - free! With nearly 100 active members, the MN LGBT Therapists' network provides an online directory of Queer/LGBT-identified and supporting mental health providers and allied professionals. We'd love to have you join us!